After the teachings on impermanence and the immanence of death, the continuous supplications to the lineage, the discipline of sojong vows and aspirations for a perfect world, came the Great Spectacle to close the Monlam. It was a dharma variety show with all the features of contemporary entertainment: multi coloured laser lights criss-crossing the vast auditorium, soft gold back-lighting behind the Buddha and the Karmapa, melodic interludes linking traditional folk song and dance performances, a show-stopping virtuoso musician, and a butter-lamp chant with full audience participation. It was quite possibly the greatest show, if not on earth, then certainly in the dharma world. The theme was the 16th Karmapa. It was he who sowed the seeds of all -encompassing love and the 17th Karmapa knows how to spread it. Using a massive stage to project it to the world, he directed the dharma play from formation to dissolution. The backdrop was the Mahabodhi Temple standing out starkly in stone. For the first few minutes the Buddha in the foreground was in darkness. When it was lit the show could begin. With the Kagyu Monlam insignia as the screen backdrop, three gelongs acted as narrators in Tibetan, English and Chinese reading from a script. After taking refuge in the three jewels and welcoming the great tulku rinpoches, invited guests and audience, they read a description of this greatest of all spectacles from the time of the 7th Karmapa to set the historical context. When the Seventh Karmapa Chödrak Gyatso held the first Monlam in the Kagyu tradition on the Otang Dawatang plain of Kongpo during the Festival of Miracles from the first to the fifteenth of the first Tibetan month, the Gyalwang Karmapa sat on a low seat in front of a shrine covered with inconceivable offerings and prostrated with respect. In the morning he recited the Twenty-Branch Monlam, and in the afternoon there were various entertainments—enactments of the lives of the Buddha or the great masters from India and Tibet, dramas of universal emperors and Tibetan, Chinese, and Mongolian kings, and enactments of the wars between the gods and demigods. Wherever the Karmapa Chödrak Gyatso pitched his encampment, rainbows ap­peared, flower petals showered like rain, and epidemics would cease. Crowds of over ten thousand would gather even in empty, remote areas. But more numerous than the throngs of people by day were the hosts of gods and spirits at night. During the fortnight of the festival of miracles, the Monlam was held under a tent of rainbows, showers of blossoms, and indescribable wonders. The New Year’s celebration of the encampment was renowned as the greatest of spectacles. This evening it was an audience packed with local dignitaries, ordained sangha, Himalayan people, international foreigners, and undefined orange-robed mendicants - as varied a group as could have attended the Great Encampment. The program was planned in the classical style, to inform and delight. Like a meditation sadhana, refuge and bodhicitta defined the beginning, honouring the 16th Karmapa was the main section with song and dance performances from the countries of his activity, and dedication of merit was the finale in lamps of light. 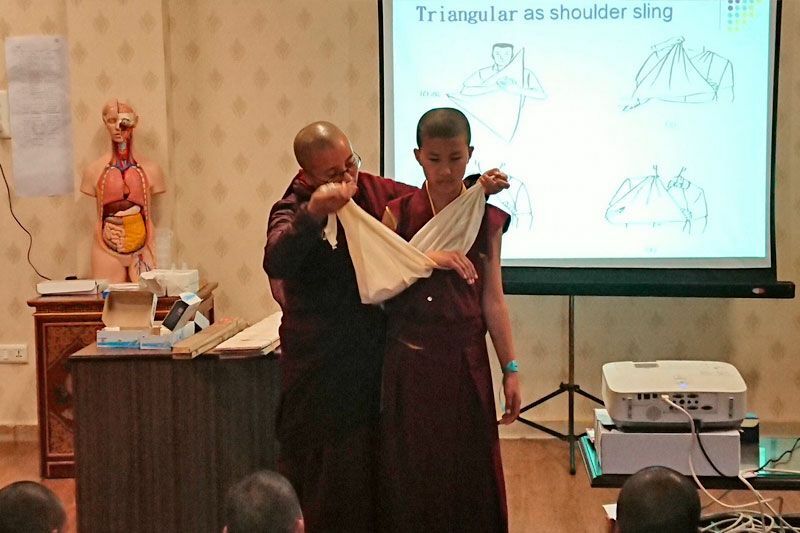 To direct the mind towards bodhicitta, young nuns from Bhutan (Drupde Palmo Chokyi Dingkhang Nunnery) in saffron robes glided onstage in two single files meeting in the centre and sang the sadhana of Chenresig to the melody of Tears of Faith. 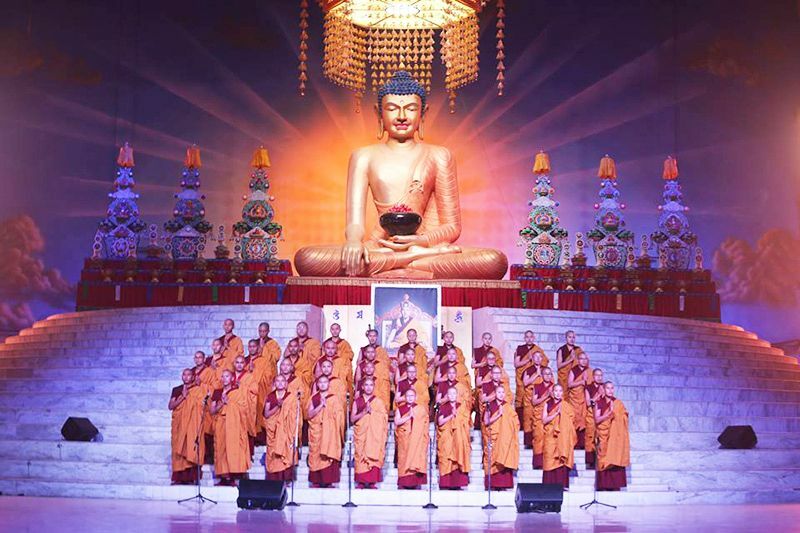 Their high clear voices and innocent faces like an angelic chorus turned the Pavilion into a vast cathedral with the audience humming OM MANI PADME HUNG. Performers from the Derge Cultural Revival Association in Bir literally kicked off the main part of the spectacle with a song ''Good Lama'' celebrating the enthronement of the glorious 16th Karmapa, Wearing the finest Tibetan felt boots, and dressed in richly decorated Khampa costumes, they swayed and shuffled, hair plaited with amber and coral, tasselled hats swinging. The background screen showed a shifting pattern of golden clouds as if to display nature's radiance. 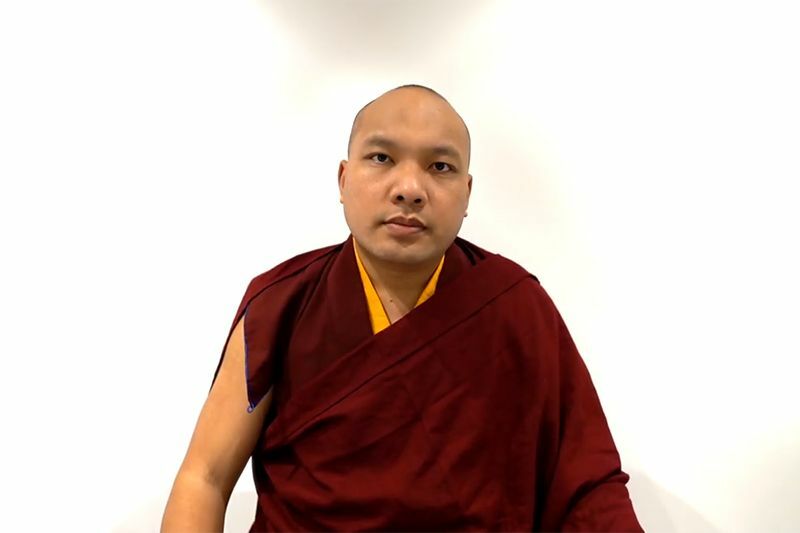 To commemorate the 16th Karmapa's poem predicting the invasion and destruction of Tibet, Dzogchen Tulku Pema Tashi gave a solo performance of Ala Tala accompanied by Tibetan guitar and flute. A troupe from The Royal Academy of Performing Arts in Bhutan paid tribute to the 16th Karmapa's connection with their four hereditary kings by performing his song in praise of the country, king and people, entitled Druk Menjong, the land of medicinal herbs. The lead singer, Pema Samdrup, held an intricately carved 7 stringed lute or drangyen with the head of a water dragon said to ward off evil spirits. The troupe wore traditional costumes with long tasselled embroidered belts and moved slowly in semi-circles. They tied the golden offering scarves around their necks, swaying gracefully from side to side while musicians played flute, lute and an exquisitely painted dulcimer. The narrators then informed us of the profound connection between the 16th Karmapa and India. Centuries ago he incarnated as the Mahasiddha, Saraha. In 1956, he was invited by the Indian Government to celebrate the 2500th anniversary of the Buddha's parinirvana in Bodhgaya. And when he was constructing his monastery in Sikkim in the 1960s, Prime Minister Nehru's government offered financial aid. In the early 80s Prime Minister Indira Gandhi donated land in Delhi to establish an Institute for Buddhist Studies. 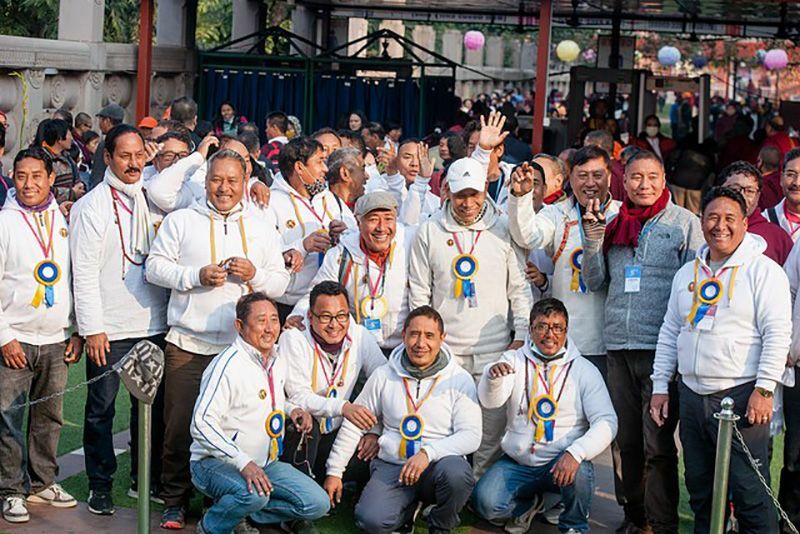 TIPA, the Tibetan Institute of Performing Arts, celebrated the cultural co-operation between Tibetans and Indians in a song that was worthy of Bollywood. In a surprising departure from their usual slow-paced style, they sang a Hindi song in a very upbeat way - in Tibetan dress and without the Bollywood dancing. Enthused by the sound of Hindi pop music, the audience immediately responded with cheers and applause while the screen showed a burst of flowers and a blast of laser lights. Right in the middle of traditional performances by acknowledged cultural organisations, came a sudden change of pace. To remind us of the 16th Karmapa's love for animals, a masterful musician from China, Chuen Jun, used a two stringed instrument called an erhu to recreate The Hoofbeat of the Horse. Dressed in white, a lock of hair falling on his face, he became one with his instrument in a virtuoso performance. The screen showed horses galloping wildly over a plain in Tibet, the sound of their hooves matching the music. The audience clapped wildly, invigorated. 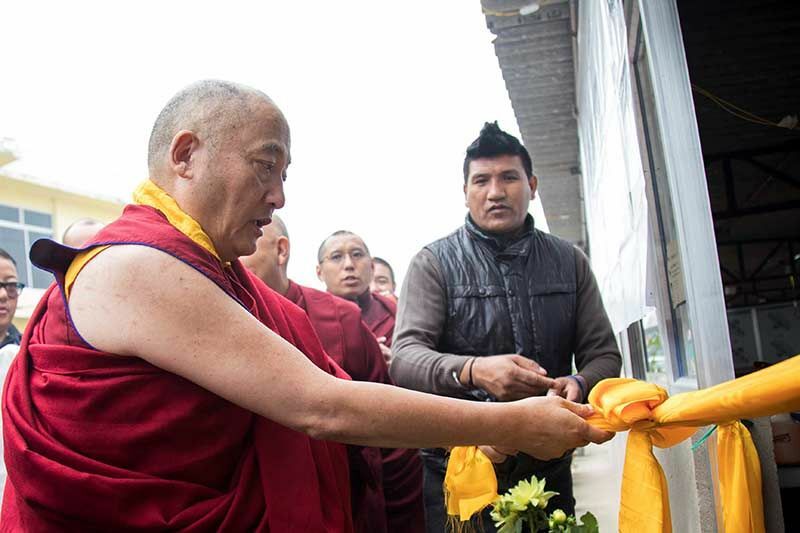 The hidden land of Sikkim where the 16th Karmapa established his seat has continued to hold special significance for the Karmapa lineage, more so now than ever. The Sikkimese' longing for their Guru to return was the theme song of their performance, entitled The Gateway of Song. The troupe of 25 dancers playing Tibetan guitar and flute represented the Department of Cultural Affairs and Heritage. In the background, the screen showed the 16th Karmapa performing the Black Hat ceremony at Rumtek, and it seemed to be almost in slow motion as one experienced the stilling of time. An aspiration for the teachings to flourish entitled Ocean of Merit and Wisdom, composed by the 16th Karmapa, brought the nuns from Bhutan back onto the stage, this time accompanied by an extraordinary guitarist. The screen documented the 16th Karmapa's activities in the West, particularly his loving intimate contact with children. We saw him in Europe and the USA, and with his birds. At this point the long haired guitarist really let go and played Western style rock music. A famous Tibetan pop singer called Phurbu Lhama sang a song called The Amazing Karmapa in a loud clear voice. And then came the grand finale of the Marme Monlam, the feast of the senses. Karmapa walked slowly onto the stage and took his throne below the Buddha. Golden lights beamed on him, while his lamp was lit, and music played softly. The lamps of the nuns onstage were alight. Soon thousands of lamps in the audience were also glowing, fluttering like moths in the night breeze, and twinkling. The laser beams criss-crossed the length of the Pavilion. Twirls of smoke went up from the lights like butter lamps into the sky. Onscreen there were cosmic explosions and simultaneous golden lasers. The final picture was of the Karmapa holding a lamp while lasers crisscrossed lotuses on the screen, and the nuns onstage led everyone in Jowo Atisha’s Lamp Prayer. May the bowl of this lamp become equal to the outer ring of this world realm of the great Three Thousands. May its stem be the size of the King of Mountains, Mt. Meru. May its oil fill the surrounding oceans. In number, may a hundred million appear before each and every buddha. May its light dispel all the darkness of ignorance from the Peak of Existence to the Incessant Hell and illumine all the pure realms of the buddhas and bodhisattvas of the ten directions so they are clearly seen. For a moment we were inside infinite universes of light. For a moment we entered a pure land. And then it all dissolved into itself. The insignia of the Monlam on a black screen was all that remained, like a seed syllable.